I love politics (I do realize that there aren't many people like me) and a history buff who also likes nothing better than watching a live comedy. War is truly wonderful. You know I guess it might have seemed that were you a Victorian army officer entering the food hall of Fortnum and Masons prior to going on campaign. Kit is packed, you have your revolver and sword and all you now need of course is to pop into Fortnum's to buy a hamper full of all the best food stuffs and delicacies Britain can produce. Yes war indeed is awful but when you are far from home in some tropical hotspot, how a chap's morale will be raised when you know you've got strawberry jam, shortbread biscuits and so many other delightful goodies to truly satisfy the taste buds. Founded in 1707 by William Fortnum and Hugh Mason it's a store that has so much of what is wonderful in Britain for over the last 300 years. Though it also has stores in Japan and the United States it's the Piccadilly store in Central London that's the very jewel in the crown and in my opinion the less ostentatious yet subtly classier competitor to the big brash Harrods of Knights Bridge. The best floor and perhaps the only floor most regular customers visit as its where all those lovely teas, chocolate and biscuits can be found, most of which bear the distinctive lime label of Fortnum and Masons own brand. I used to think there was just Earl Grey tea, until Fortnum's introduced me to Lady Grey, Smokey Grey and countess grey. Twenty Five teabags will cost you three pounds. That is slightly more than a pack of normal tea bags, but then you don't go to Fortnum's expecting everything to be cheap. If you are ever stuck for a gift a Fortnum and Mason hamper is sure to raise a smile. What's even better is that the cost of Hampers with various fillings range from 200 at the top end to a very reasonable 40 pounds, and if you spend 200 or more delivery to a UK address is free. It's logical to conclude that the more you spend on something the longer it lasts. Thus I expect most people love to equip their kitchen with all the spoons, knives and ware that is on display on Fortnum's first floor. But again the cost can be prohibitive. That said, what I have bought there is always of such high quality I am still using it years after it was purchased. After climbing up a wonderful carpeted Georgian staircase the second floor is certainly one for the ladies. The gentle aroma of perfumes and scents greet you as you wander among low tables adorned with beautifully packaged collections of soaps and creams. Again some of the prices can be at the high end but then if Fortnum's relied solely on the custom of millionaires they'd soon be bust. Take your time and look around there is always something to suit every price range. Solid and Traditional is probably the best way to describe the third floor of men's accessories. Extremely well made leather wallets, bags, book covers and of course gentlemen's hankies are to be found on small tables across the floor. Many items do not have a price tag and they say if you need to ask the price of something then you can't afford it. Unlike the ladies floor reasonably priced items are few and far between. 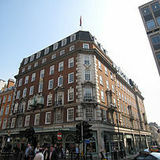 There are numerous restaurants and tea rooms at Fortnum's. The ground and first floor are two quaint little corners of an England that are sadly disappearing in much of London yet here is where someone can enjoy a muffin and cup of tea at not too exorbitant prices. Invariably anything that changes its name to something royal will be imbued with pretentious leanings. The reception desk of the newly named Diamond Jubilee Tea Room on the fourth floor is as far as I've ever got before my fundamentally working class made it feel that I didn't belong there. Money can get you anywhere in the world but in places like the Diamond Jubilee Tea Room it's ultimately always going to be the home of those from the landed gentry and who've never known what a hard day's work really means. Where all the real food is kept, fine wines, cheeses, vegetables and meat and fish. To be accidentally locked away in Fortnum and Masons wouldn't really be a mistake. It will be a dream come true.